You would think with AC1750 and AC1900 routers all the rage now, that there would be a growing market for matching bridges. But there are precious few of these beasties, most of which are basically the same hardware as their router equivalents with a firmware load locking them into functioning as dedicated bridges. The other two things that are suppressing the market for dedicated AC bridges are their high cost—essentially the same as their router siblings—and the fact that many top-end routers include bridge functions. Linksys' WUMC710 is the rare bird that is trying to fly against the prevailing wind. 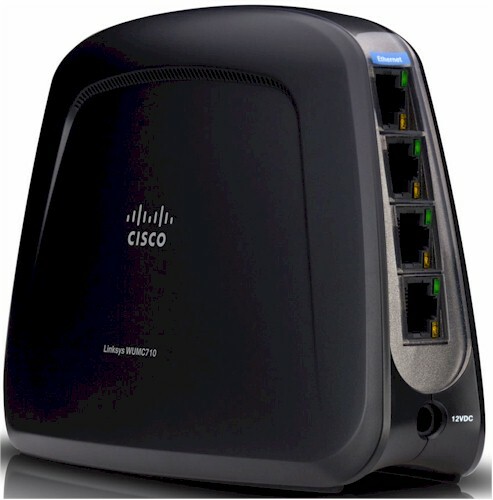 It's a 5 GHz only AC1300 class (3x3) dedicated bridge with built-in four-port Gigabit switch. And to perhaps entice buyers who would otherwise opt to buy a second router for their bridge, it's priced very aggressively right now at about half its normal $90. This review was originally going to be a head-to-head including WD's My Net AC Bridge. But since WD has exited the business and because I had already tested it, the only thing I'll do is use it for comparison when I discuss the WUMC710's performance. I should also mention that Linksys has discontinued its WES610N N900 bridge. So if you simply must have a Linksys wireless bridge, the WUMC710 is your only option for now. Speaking of the WES610N, the WUMC710 looks very much like it as shown in the callout diagram below. There's not much to it with four Gigabit Ethernet ports and power port on one end and indicators and Wi-Fi Protected Setup (WPS) switch on the other. The vertical design has the three antennas spread across the arched top of the bridge, so you'll probably want to point one of the sides toward the router you're bridging to for best performance. A peek at the FCC ID internal photos shows a pretty standard first-generation AC router design based around Broadcom's BCM4706 SoC and BCM4360 AC radio. The table below compares the 710 to Linksys' EA6500 AC1750 router. I've been testing a lot of bridges lately and have to say that most have greatly improved upon the convoluted and often frustrating setup process that have been the hallmark of these devices. Sad to say, the WUMC710's setup is more old school than new if you don't opt to set it up using WPS pushbutton. The 710 will grab an IP address if it detects a DHCP server plugged into any of its LAN ports. But since you would normally plug the device you are trying to connect into it (which won't have a DHCP server), it will set itself to a default IP of 10.100.1.1. This means you'll need to set your device IP to something in the same range (like 10.100.1.10) to connect to the admin pages and finish the setup. Alternatively, you can plug the 710 into your LAN router, let it grab an IP, check your router's DHCP list for the 710's IP address, use that IP to access the server and set a static IP so that you don't lose it. Compared to the captive-portal techniques I've been seeing on the other more recent-vintage N bridges I've been testing, setting up the 710 was much more difficult. Here's a shot of the login landing screen showing the classic Linksys admin look. I've put screenshots of the other admin screens in the gallery below. Default wireless setup is WPS. You can also enter the SSID of the target network direction via manual option. There is also a site survey. Clicking the connect button takes you back to the manual wireless setup screen where you confirm the network SSID and enter the WPA key. No more confusing WMM settings. All you get to do is enable/disable. Leave these alone because you need WMM enabled to get link rates above 54 Mbps. Management settings are self-explanatory. There is no HTTPs admin support. Status of the wireless network. Kudos, Linksys, for including link rate! I used our new test process, which is also used for testing wireless adapters, to test the WUMC710. The bridge had its original v1.0.01 firmware loaded because there have been no updates. The bridge was placed so that its left side (viewed from the indicator end of the product) faced the test chamber antennas, which were 8" away. The ASUS RT-AC66U reference router was set to Channel 153 and Auto 20/40/80 MHz bandwidth mode. The Benchmark Summary shows the averages of all the measurements made in both directions. Note the distinct imbalance between up and downlink. As I mentioned earlier, I have tested only one other dedicated AC1300 bridge, the WD My Net AC Bridge. So both are included in the throughput vs. attenuation plots below. The WUMC710 is clearly outperformed by the WD bridge, especially on uplink. Given its rather disappointing performance, the only thing the WUMC710 has going for it is its price. If $50 is all you have in your AC bridge budget, the Linksys is the only game in town. But if you're willing to goose your budget to $60 or so and don't mind buying a discontinued product, the WD My Net AC Bridge is the better performer of the two. But given these two uninspiring choices, I suspect most of you will look for sales on your favorite AC router if you need a bridge.